Zelda Breath of the Wild gamers that would like to replace Link with “Twitter’s favourite turtle girl” may be interested in a new mod which is currently under development and has been created by Lynard Killer from BOTW modding club. 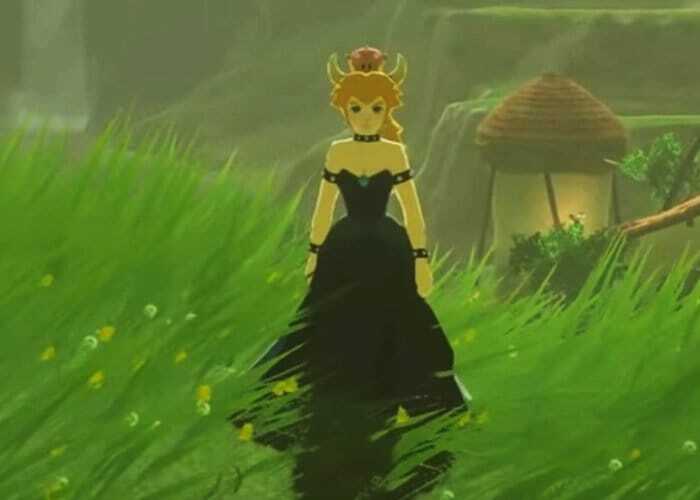 Check out the three-minute video below to learn more about the mod that allows players to explore Hyrule as Bowsette. But be warned “if you happen to wander into any fire, her dress goes up in smoke”. “At the September 13th, 2018 Nintendo Direct, Nintendo unveiled a trailer for New Super Mario Bros. U Deluxe for the Nintendo Switch (trailer shown below). The trailer also introduced an unique power for Toadette, the Super Crown, which allows her to transform into a character called Peachette (based on the series’ Princess Peach). On September 19th, 2018, Twitter user @ayyk92, aka Haniwa, posted a comic in which, after Mario and Bowser are romantically rejected by Peach (inspired by the events of Super Mario Odyssey), Bowser undergoes the same transformation as Toadette into “Peachette,” turning into a human woman. The female Bowser and Mario then appear to be dating. The comic gained over 15,000 retweets and 42,000 likes within the next few days. Alongside they also uploaded the comic to their DeviantART a few minutes prior to the Twitter post,although this version only managed to collect over 4,600 favourites in the next 10 days.” Learn more in the video explanation below.